The legislation lists multiple definitions of sanctuary policy. One definition is orders, ordinances or law enforcement policies that "limit or prohibits a municipal officer or person employed by the municipality from communicating or cooperating with federal agencies or officials to verify or report the immigration status of a person within the municipality." Another definition of sanctuary policy, according to the bill’s language, would be anything that "grants to illegal immigrants the right to lawful presence or status within the municipality in violation of federal law." Before the bill was even brought to the floor. Rep. Charles Blake, D-Little Rock, asked for a fiscal impact statement on the legislation. That request was denied. While immigration is mentioned in five of the six definitions of "sanctuary policy," Rep. Brandt Smith, R-Jonesboro, who presented the bill to the House floor, said this bill was ultimately not about immigration policy. Smith also mentioned concerns that were brought up on the bill during committee, including the apprehension that this legislation could lead to lawsuits against the state. "One witness testified that if we support this bill, we’re going to be sued. I don’t like threats like that. I don’t think anyone in this room likes to be threatened like that and yet that is what we heard," Smith said. Smith did not take any questions from other lawmakers about the bill. 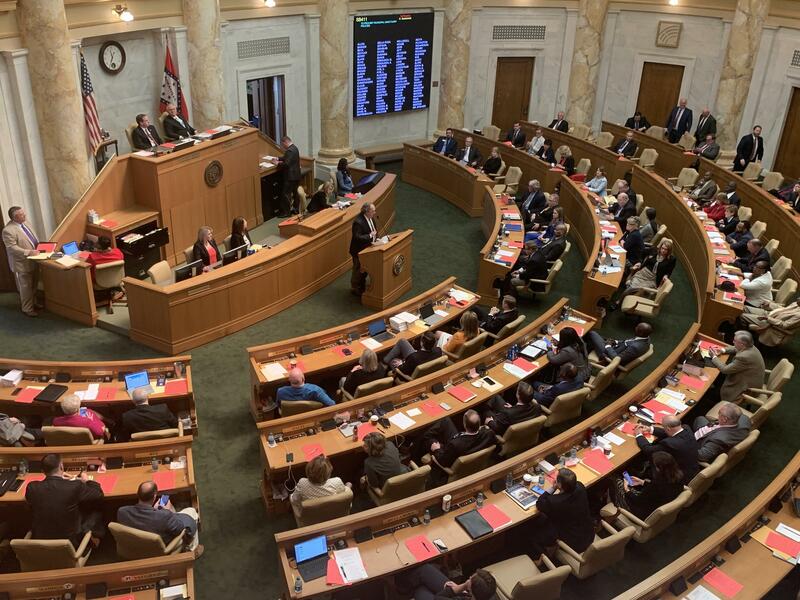 Before debate began on the bill, Rep. Aaron Pilkington, R-Clarksville, made a motion to consider the bill immediately without debate, while Rep. Jeff Wardlaw, R-Hermitage, made a motion to limit debate to 10 minutes on each side. House Speaker Matthew Shepherd did not take up either motion. Rep. David Whitaker, D-Fayetteville, spoke against the legislation. He said as a lawyer, he would only speak to his legal objections to this bill. According to Whitaker, in his opinion, one of the first issues he noticed was that the Attorney General is the "investigative and enforcement official" for this legislation. "Any reading of it leaves the firm conclusion that the AG will become judge, jury and executioner for any municipality accused of violating this law," Whitaker said. Whitaker also brought up that he did not see any form of due process as another one of his concerns on the bill’s constitutionality. "If someone makes a complaint against a municipality that they are quote 'violating this law,' how do they know? Are they noticed? Are they told, 'Hey you’re in violation?'" Whitaker said. Rep. Marcus Richmond, R-Harvey, spoke in the bill’s favor, saying all this bill does is make sure Arkansas’s laws reflect national ones. In speaking against the legislation, Rep. Nicole Clowney, D-Fayetteville, legislators can be for anti-sanctuary city legislation and still be opposed to this particular bill. "This bill opens our cities up to a huge amount of litigation. This bill will create distrust between our cities and our immigrant population, undermining our cities’ ability to control for themselves how to further their own good will and public safety," Clowney said. Debate was eventually stopped and the House voted in favor of the legislation. It now goes to Gov. Asa Hutchinson who said he would sign the legislation into law. Speaking at a news conference on Wednesday, Hutchinson said he did have concerns that an erroneous implementation of the law could lead to issues. "If there’s instances of improper application of policing, it could result in lawsuits or other things that are raised, but I have no doubt that the attention of any improper policies would be brought to our office. And then you have to make a decision as to what you do about it," Hutchinson said. In addition to this legislation, the House took up other issues Wednesday including: rejecting a bill that would have prohibited judges from revoking driver licenses as a penalty for offenses not related to driving a motor vehicle and passing a resolution that changes how committees are assigned to legislators for the next legislative session.